Hosted by HPR_AudioBookClub on 2014-03-13 is flagged as Explicit and is released under a CC-BY-SA license. 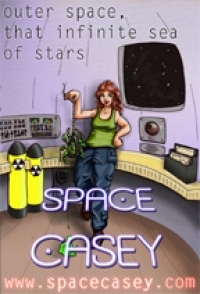 In this episode of the HPR Audiobook Club Broam, Jonathan Nadeau, pokey and Christiana Ellis discuss the podiobooks.com presentation of Space Casey written and produced by Christiana Ellis. This episode contains spoilers in the second half, so please listen to the audiobook for yourself before listening to the podcast all the way through. This audiobook was liked by all of the panellists on this episode. During this show the hosts also discuss beverages. Our next audiobook will be Shaman Tales 1: South Coast by Nathan Lowell. It is available at podiobooks.com The direct link is: http://podiobooks.com/title/shaman-tales-1-south-coast/ This audiobook was suggested to us by Christiana Ellis, who liked it very much. http://christianaellis.com/?feed=podcast You can send feedback directly to Christiana via email christianaDOTellisATgmailDOTcom and as always your feedback is welcome in the comments section of every episode. We all had a great time recording this show, and we hope you enjoyed it as well. Thank you very much for listening. P.S. Some people enjoy finding mistakes. For their enjoyment, we have included a few.